Thanks Insided for inviting the AWS Amsterdam community to your office in Amsterdam! A couple of years ago the Amsterdam Community started with meetups at Insided, so we're happy to be back in this trusted home! Great talks by Insided and StackState, about how to use AWS native services to facilitate the Continuous Delivery, Monitoring and getting Control on you AWS stacks. In this talk we will go over the benefits and the drawbacks of fully AWS based continuous delivery for multiple AWS accounts and regions. - Why A multi account setup? Applications and infrastructure are constantly evolving and continue to span multiple environments. As the complexity of the environments increases due to cloud initiatives, getting visibility into these dynamic and distributed environments becomes more difficult. How do you stay in control? We show how to consolidate all AWS information and get insights of the health of your AWS stack and services using AWS native APIs. Missed this AWS event? 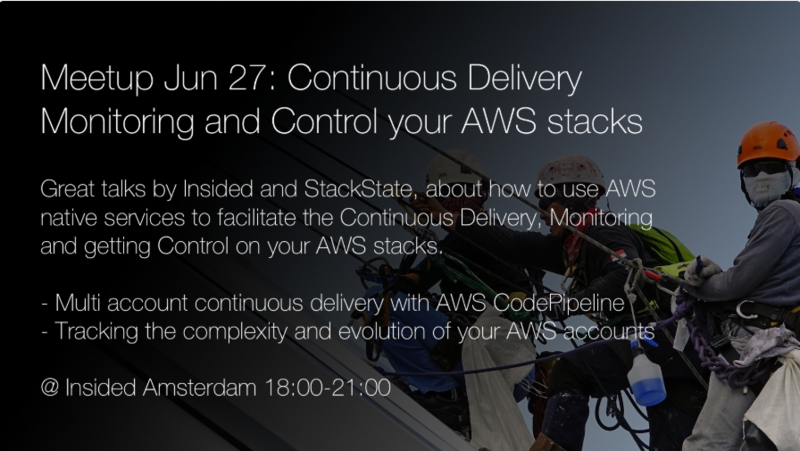 Check the Meetup page directly: AWS Amsterdam!